What started out as a popular pet species, is now threatening an entire ecosystem. Burmese Pythons are an established invasive species in Florida that have no natural predators. Can the Florida Everglades control these populations or will the natural biodiversity continue to suffer? Figure 1. Burmese Python (Python bivittatus) in the Florida Everglades. Courtesy of R. Cammauf, NPS, 2005, FlickrCommons. Public Domain. The Burmese python (Python molurus bivittatus) is a species native to the tropics in South and Southeast Asia.3,6,9,11 As a popular pet species, many were brought to the United States.3,8,9,11 However, many owners did not realize that this species of snake was one of the five largest in the world and may grow to over 5.5 meters (18 feet) in length.1,2 Many unprepared owners released these snakes into Florida’s Everglades after they grew too large to handle.9,11 Enough of these snakes were released that a large, wild breeding population rooted in Florida.9,11 The Burmese Python became an established invasive species which is thriving and threatening the ecosystem of Florida’s Everglades. Figure 2. Burmese Python Zones of Inhabitance. Courtesy of Terminija, 2013, Wikimedia Commons. CC BY-SA 3.0. and USGS, 2007, Wikimedia Commons. Public Domain. Burmese pythons are having a significant impact on the ecosystem and biodiversity in the Everglades and surrounding areas. As an invasive species, the python has no natural predator in Florida, making it an apex predator in the area.1,5,8 Therefore, the population of these snakes is not being naturally controlled. 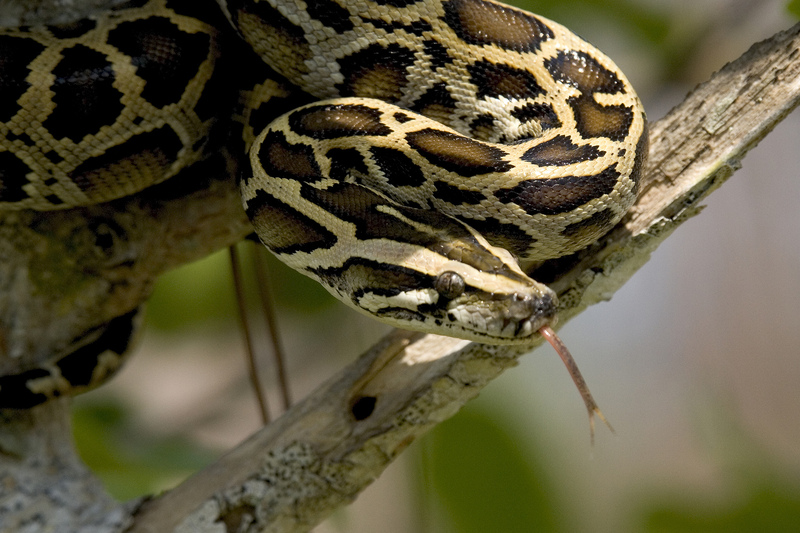 Since the invasion of these snakes in 2000, there has been a large decline in many animal populations across the Everglades.1,2,3,5,8,11 Burmese pythons have the ability to eat prey much larger than itself through unhinging its jaw, and therefore there is no animal safe from this predator in the Everglades. One of the previous top predators, the American Alligator, has been observed being eaten by these huge snakes (Figure 3).1,3,5,8,11 Road surveys done after the introduction of the pythons, discovered a decrease of 98.9% for opossum, 87.5% for bobcats, 99.3% for raccoons, and a 100% for rabbit observations.1 This is evidence of top down pressure on all the species below the pythons on the food chain.1 Another study tracked and monitored Marsh rabbits to discover that Burmese pythons were accountable for 77% of rabbit deaths, which was larger than the control group with no pythons where 71% of deaths were caused by native predators.5 Large numbers of birds, especially songbird populations, have also been in a recorded decline since the introduction of this invasive species.2 In dissections of these snakes, all variety of wildlife in the Everglades has been found, including household pets.11 With no natural predators, the pythons are thriving and growing to large sizes. Burmese pythons nearly large enough to break the world record have been recorded.10 Another impact of these snakes is a lack of food for other animals, especially other predators. Figure 3. Both the American Alligator and the Burmese Python frequent the Florida Everglades. There have been several documented cases where these large predators predate on one another. Photograph by Lori Oberhofer, NPS, 2008, Wikimedia Commons. Public Domain. One of the main questions for researchers is how these snakes are surviving the cold temperatures, and if they will spread further into North America.6 Burmese pythons are cold blooded and adapted to the warm weather of the subtropics of South Asia. They are unable to survive in very low temperatures for long periods of time. Burmese pythons need a minimum temperature of 0°C (32°F) for survival and 16°C (61°F) for digestion, and Florida is known to drop below freezing on rare occasions.4 Florida’s average low temperature is about 12°C (54°F), which may prevent the pythons from digesting food in the very cold winter months.4 However, it was discovered that these snakes are surviving using a unique form of thermoregulation, one that the Burmese python has never been recorded using.9 Temperature data loggers placed in brooding mother’s nests showed that the snake was using shivering thermogenesis to survive and keep her eggs alive.9 Temperatures in the nest were measured and showed to be warmer than surrounding temperatures outside, helping to provide insulation for the clutch.9 Burmese pythons were also discovered using brumation as a technique for surviving the cold weather. During brumation the snakes will go to a warmer place, like an underground burrow, and enter into dormancy until the weather warms. These traits are the necessary tools for survival in Florida’s relatively cold weather. Yet, the research also concluded that Burmese pythons will not be able to survive winters in sites further north of the Everglades due to their lack of greater behavioral traits that would help them tolerate colder temperatures.4 These pythons might not be able to spread further into the United States, but they already have a steadily increasing breeding population in Florida. Extensive research has been conducted to see if these snakes are a threat to humans. Research concluded that these snakes will not prey on humans.3,7 Most reported bites and injuries were from Burmese pythons kept as household pets.7 The same study found 5 reported incidents of snake strikes between 2006 and 2012, which were all dealt to biologists moving in the Florida wetlands.7 There were no reports of constriction and therefore these strikes were considered to be cases of mistaken identity.7 This study also showed that no strikes have occurred to the nearly 1 million annual Everglades visitors.7 It was concluded that Burmese pythons, though detrimental to the surrounding ecosystem, are a low risk to humans. Figure 4. Burmese Pythons have been observed to reach 19 feet in length. Since their immigration to Florida, they can now be found throughout Everglades National Park, including on trails and roads. Courtesy of the National Park Service, Public Domain. Many steps have been taken to reduce the population of Burmese pythons in the Everglades, but it is a failing endeavor. In the Lacey Act, Burmese pythons were listed as an injurious species, and bans have been put in place for the transportation of these snakes and other large pythons.11 Many traps have also been set to capture Burmese pythons and release them into their natural environment or send them to zoos and research facilities. In some instances, snakes are being killed. One research team has radio tagged the pythons to follow them to where the populations gather and hide.3 Despite all this effort, the Burmese python population is still increasing. Figure 5. Number of pythons removed from Everglades National Park and surrounding areas from 2000-2012. Everglades National Park employees have help a suspicion for many years that the pythons were reproducing in the area. They have uncovered hatchlings in the park, as well as, captured larger female pythons that were carrying eggs. Scientists first discovered nests in 2006. The reproductive potential and nests of the python are of great concern for those working to limit the python population and protect the Everglades ecosystems. Education, prevention, early detection, and rapid response, are the methods the South Florida Natural Resources Center emphasize to citizens. They also encourage individuals to be responsible per owners with their campaign “Don’t Let It Loose.” Data obtained from Skip Snow, NPS, 2013. Public Domain. The Burmese python is an invasive species to Florida’s Everglades, released by people who were not prepared to care for them as pets. The pythons are disrupting the natural ecosystem. The biodiversity in these areas has decreased rapidly and efforts to remove them have not been successful. Although not a direct threat to humans, the Burmese python may forever alter the biodiversity of the Florida Everglades. Dorcas, M.E., et al. (2012). Severe mammal declines coincide with proliferation of invasive Burmese pythons in Everglades National Park. Proceedings of The National Academy of Sciences of The United States of America (PNAS), 109(7):2418-2422. Dove, C.J., et al. (2011). Birds Consumed by the invasive Burmese python (Python molurus bivittatus) in Everglades National Park, Florida, USA. Wilson Journal of Ornithology, 123(1):126-131. Jacobson, E.R., et al. (2012). Environmental temperatures, physiology and behavior limit the range expansion of invasive Burmese pythons in southeastern USA. Integrative Zoology, 7(3):271-285. Reed, R.N., & Snow, R.W. (2014). 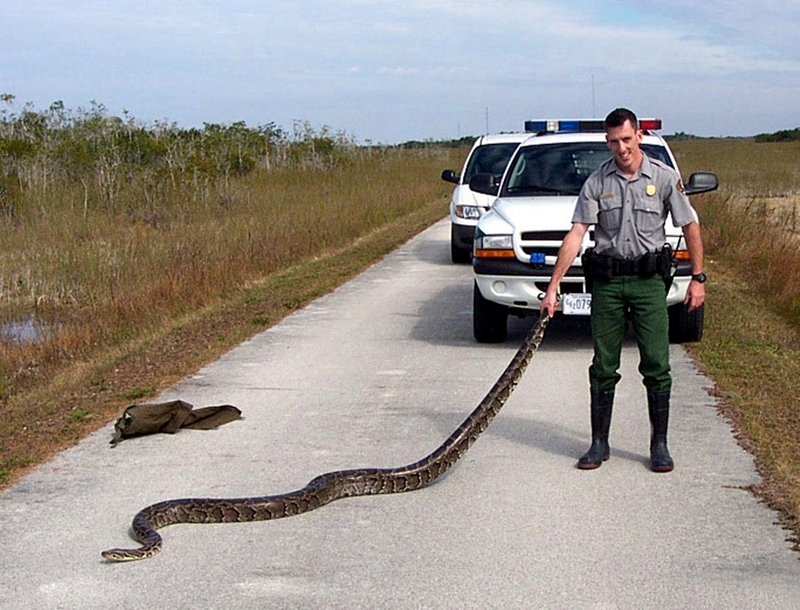 Assessing risks to humans from invasive Burmese pythons in Everglades National Park, Florida, USA. Wildlife Society Bulletin, 38(2):366-369. Snow, R.W., et al. (2010). Thermoregulation by a brooding Burmese python (Python molurus bivittatus) in Florida. Southeastern Naturalist, 9(2):403-405. Cammauf, R., Everglades National Park Service. (2005). [Photograph of the Burmese Python]. Retrieved from FlickrCommons. Public Domain. National Park Service. [Photograph of park officer with python]. Retrieved from https://www.nps.gov/media/photo/gallery.htm?id=3F4C9B3B-1DD8-B71C-078F792D3F1A85AF. Public Domain. Oberhofer, Lori, National Park Service. (2008). 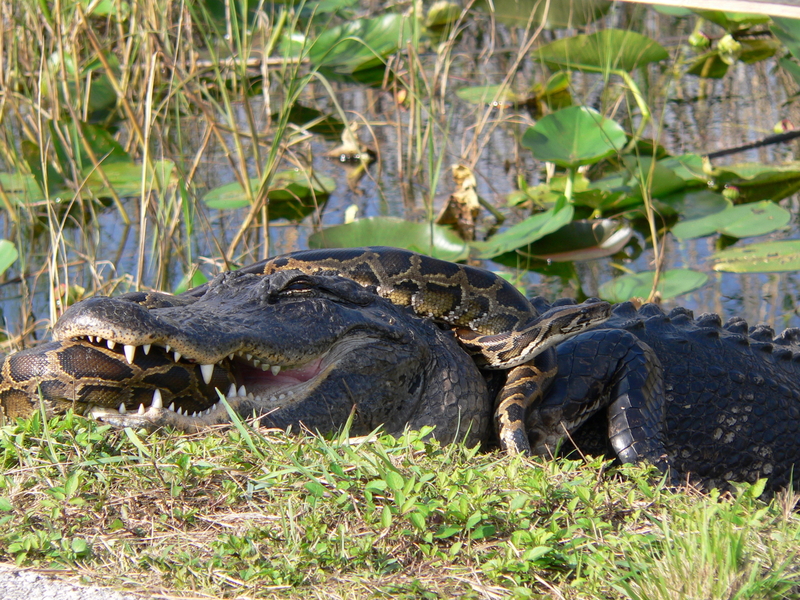 [Photograph of American alligator and Burmese python located in a struggle to prevail in Everglades National Park]. Retrieved from Wikimedia Commons. Public Domain. Termininja. (2013). [Native range of the Burmese Python map]. Retrieved from Wikimedia Commons. CC BY-SA 3.0. United States Geological Survey. (2007). [Map of the 2007 introduced ranges in the USA of Python molurus bivittatus]. Retrieved from Wikimedia Commons. Public Domain.